What a wonderful addition for Betsy’s house! 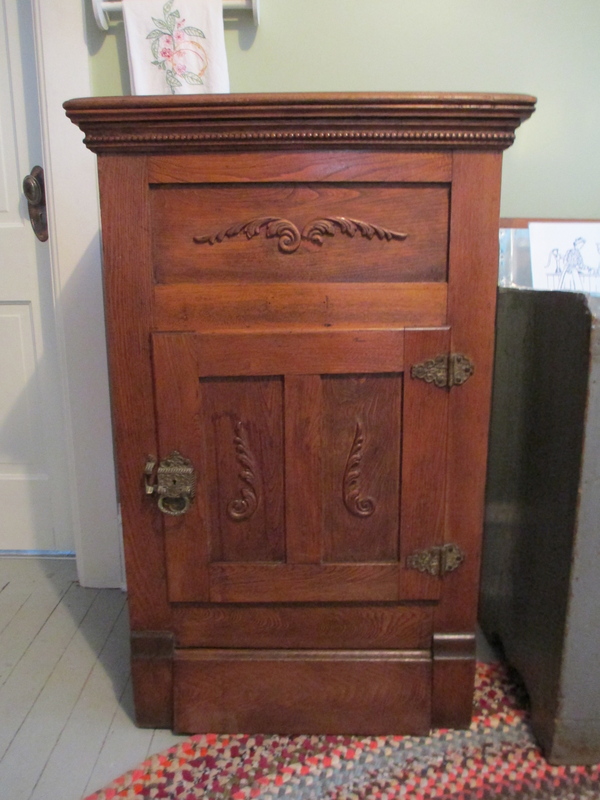 The Betsy-Tacy Society recently received a vintage icebox that is now on display in Betsy’s kitchen. The icebox is on loan from a former BTS board member. Iceboxes date back to the mid-19th century and were used through the 1930s when electricity and refrigerators were introduced into the home. The Hart and Kenney families most likely had ice delivered to their homes by the Mankato Ice Company. The ice company, owned by C.W. Miller, had its main ice-storage house located on Owatonna Street in West Mankato. They filled their buildings each winter with ice cut from the Blue Earth River, Indian and Spring Lakes. Nature purified the water as it froze, forcing dirt and bacteria into the water below. It was this crystal clear ice that was harvested in the winter. The ice harvest took place in January each year. Townspeople and farmers were hired to prepare the ice field, cutting the big 300 to 400-pound cakes, elevating them out of the river onto sleighs to be hauled to the ice storage houses. There the cakes were placed layer upon layer and then covered with sawdust. In the summer the sawdust was removed from the “sleeping” ice and moved onto the delivery wagons. The icehouse would remain cool all summer where the ice still remained covered by sawdust. The ice man and his horse-drawn ice wagon made regular door-to-door deliveries of block ice for their customers’ iceboxes. Some homes had small doors that opened to the icebox from the back porch. The iceman brought the block of ice and inserted it into the icebox through this door. On hot summer days children eagerly awaited the arrival of the iceman, hoping that when he cut the cake of ice to fit their mother’s icebox a few big sparkling chips would be left on the wagon for them to enjoy. Can’t you imagine Betsy, Tacy and their friends enjoying ice chips from the ice wagon on a hot summer day? 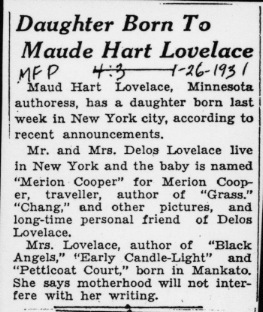 Maud and Delos Lovelace announced the birth of their 6 pound, 14 ounce, blond-haired, blue-eyed baby girl born Sunday, January 18, 1931 in Manhattan, New York at ten forty-two a.m. 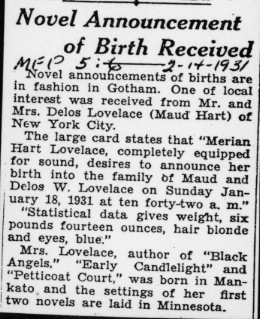 The newspaper announcement reported the couple named the baby, Merian Hart Lovelace, after Merian C. Cooper, a long-time personal friend of Delos. Maud with her daughter, Merian. Merian Hart Lovelace was the little girl who inspired the Betsy-Tacy books. 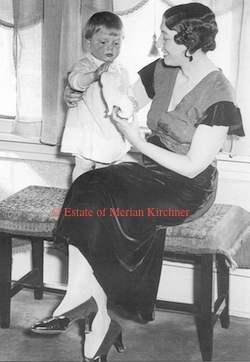 It was Merian, growing up in the 1930s in Garden City, Long Island, who first demonstrated that her mother’s childhood had more than passing appeal. By the time Merian was six years old, Maud was telling her stories about her childhood in Mankato. She pestered her mother so often for a new story about Betsy Ray and her friend Tacy Kelly that Maud, who had concentrated on short stories and historical novels, decided to put Betsy and Tacy on paper in 1938. When Betsy-Tacy was published in 1940, Merian was nine years old. The book was never intended to be a series, but Delos and Merian encouraged Maud to continue. Old letters, diaries, photographs, and other mementos provided research material, but most importantly, Merian helped her mother remember what it was like to be a certain age. Merian graduated from high school the same year Maud was writing about Betsy’s graduation in Betsy and Joe, and when Merian went to college Maud was writing Carney’s House Party. During the writing of Betsy’s Wedding, Merian married Englebert Kirchner, a German-born writer. It was little Merian Lovelace whose pleadings for just one more bedtime story gave birth to a beloved series of children’s books. Remembering Delos Wheeler Lovelace who passed away forty-six years ago from a heart attack on January 17, 1967 in Claremont, California. He was 72 years old. Many Betsy-Tacy fans know Delos Lovelace as the husband of Maud Hart Lovelace. But did you know that Delos had his own extensive career as a talented newspaperman, writer and author? Delos was born December 2, 1894 in Northern Minnesota. He met Maud Hart in 1915 while working for the Minneapolis Tribune. He was a true newspaperman at heart, working for the New York Daily News, the New York Sun and the New York World Telegram holding positions as reporter, night editor, assistant city editor and city editor, feature writer and syndicated columnist. When an illness forced him to retire from the newspaper business for a period of time, Delos turned to writing short stories. He became a successful freelance writer, selling stories to all the popular magazines in the 1920s, including the Country Gentlemen, Saturday Evening Post and the Ladies Home Journal. He returned to newspaper work in 1928 and retired from the profession in 1952. He was the author of two biographies, Rockne of Notre Dame and General Ike Eisenhower; a novel Journey to Bethlehem, and a children’s book, That Dodger Horse. He’s probably best known for his novelization of King Kong in 1932. Delos and Maud collaborated on many short stories over their nearly 50-year marriage. They co-authored two novels, One Stayed at Welcome and Gentlemen from England and a children’s book, The Golden Wedge. Gone but not forgotten. Rest in peace, Delos. Winter in Deep Valley really begins with the first snowfall of the season, which is eagerly anticipated by children and adults alike. A fresh coat of white, glistening snow covers the otherwise brown, barren trees and lawns. The snow brightens our spirits as thoughts of winter fun await. Maud Hart and Bick Kenney (Betsy and Tacy) enjoyed many of the typical turn of the century winter activities in Mankato (Deep Valley) including sledding, tobogganing, ice skating, sleigh rides and sleigh bells, and snow balls and snowmen. Maud writes in Chapter 9: “Snow loaded the bare arms of the maples, it lodged in the green crevices of firs, it threw sparkling shawls over the brown bushes shivering on Hill Street lawns…Men and boys shoveled “Indian trails” for the children to walk to school. Along with the scraping of shovels came the frosty tinkle of sleigh bells, as runners replaced wheels on the baker’s wagon, cutters replaced carriages and buggies and farm wagons creaked into town on runners….Skates were sharpened; and down on the river, snow was swept from the ice.” Tacy’s brother Paul made a giant snowman and Tib’s brothers, Freddie and Hobbie, built an Ice Palace. Margaret and the Rivers children took out their sleds, “painted brightly with pictures of flowers, dogs and horses”. Betsy and Tacy thought they were now old enough to go bobsledding, like their sisters Julia and Katie and their friends, and Mr. and Mrs. Ray gave their approval. “Long, low and reckless, the bobsleds flew from the top of the Big Hill along a hard-packed frozen track in a thrilling sweep, almost to the slough.” On the east, Lewis Street ended at the bottom of the “Big Hill”. In 1904, Lewis Street went all the way to the slough to the west. It no longer extends this far, but in Maud’s day Lewis Street went on for more than eight blocks! Bobsledding in these days was common in Mankato because of the many hills that provided perfect sledding or tobogganing runs. Older residents remember the tales of sledding down the steep Main Street hill. The best part of enjoying the outdoors in the winter was coming inside to warm up. Betsy and her friends came inside to the sound of popcorn popping and they put “apples to roast on the back of the hard-coal heater”. They played the piano, sang songs, and rolled up the rug for dancing in the dining room. Winter certainly isn’t all fun, especially when a blizzard threatens. Although Maud doesn’t write about a winter blizzard in the Betsy-Tacy books, she did experience the blizzard of 1909. 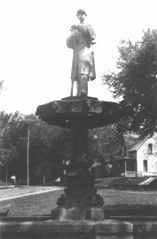 In January 1909, a blizzard isolated Mankato from the rest of the world, halting telephone service, telegraph and transportation services as rain and sleet gave way to wind-driven snow. 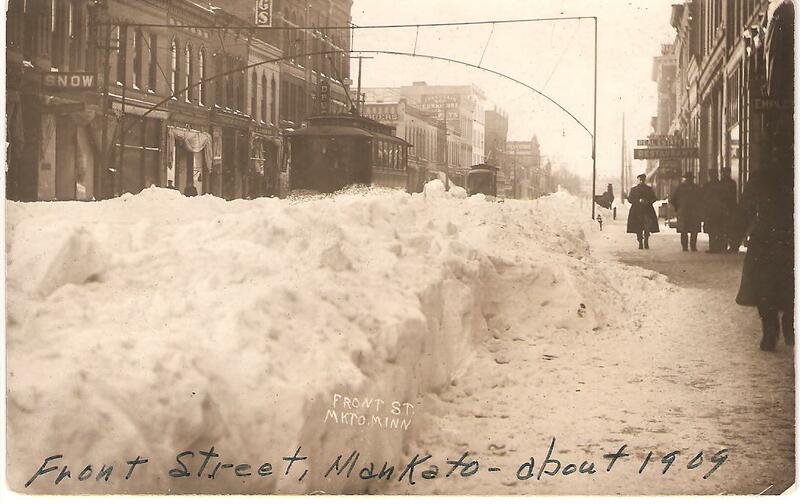 View of the 300 block of Mankato’s South Front Street after the blizzard, January, 1909. Reported in the January 29, 1909 issue of The Free Press: “wires and poles were snapped off by the weight of the ice that had formed on them and the wind blew a terrible gale. Ice particles beat pitilessly in the faces and eyes of all who were obliged to go out and snow drifts encumbered their feet.“ Electric lights and streetlights were cut off to avoid accidents caused from touching or stepping on crossed wires. School closed, trains were delayed hours and rural route mail carriers did not go out in the fearful storm. Many of the same winter activities are enjoyed today and will never get old. But with time comes change. We now have snowmobiles, snowblowers and indoor ice arenas. Can you imagine a bobsled coming down the middle of the street? Or hearing the chime of sleigh bells and horses hooves on a snow filled street? You can almost feel the cold wind on your cheeks, hear the sleigh bells ring and smell the popcorn as you read Betsy and Tacy Go Downtown. 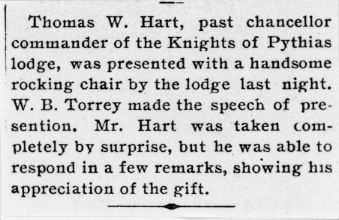 112 years ago today, Thomas W. Hart was presented with a “handsome” rocking chair by the Knights of Pythias lodge for his service as past chancellor commander. In 1901, Thomas Hart was 37 years old. He and his family were living at 333 Center Street in Mankato. 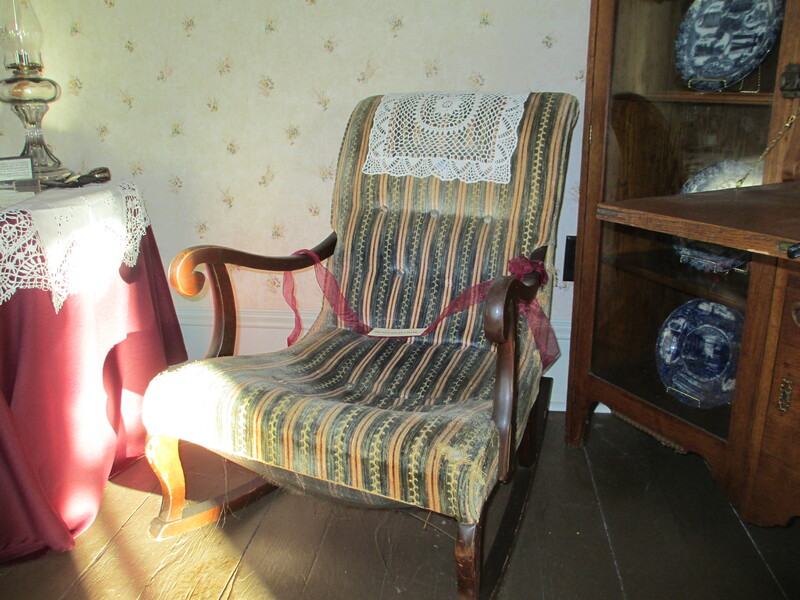 This rocking chair, donated to the Betsy-Tacy Society by the estate of Merian Lovelace Kirchner, is proudly on display at Betsy’s House. The Knights of Pythias is a fraternal organization founded in Washington D.C. in 1864. Members are involved in their communities and their activities are directed towards enhancing the principles of Friendship, Charity, and Benevolence. William B. Torrey made the speech presenting Tom Hart with the gift of the rocker. William was a retired probate judge. He and his wife Gertrude lived on Byron Street, across from the Pleasant Grove School and a few blocks from the Hart home. After William’s retirement, he and Gertrude operated a small neighborhood grocery business on Byron Street. Maud used Torrey’s Store as the basis for Chubbock’s Candy Store and Gertrude Torrey for the character of Mrs. Chubbock in the Betsy-Tacy books.